Home » Posts tagged "Standard Operation Procedure for Stickering Process"
In this paper, a study was conducted in the cutting and CAD section under a garment manufacturing company. The implementation of standards in industry became highly important with the onset of the industrial revolution. Maximum garment industries are facing different problems like low productivity, longer production lead time, high rework and rejection, low flexibility, lower quality product, high non-value added work etc. In this study these different problems were identified by using numerous effective production control tool like work standardization. The encouraging results after implementing the tool give the way to go forward and thrust to reach at the end point. Some key benefits of this implementation are decrease in sample rejection level by 60%, reduction of work level for repairing works by 70% eliminating bottleneck process results in reduction of excess motion and non-value added works by 50%. As a result, total processing time for final output is decreased. After the implementation of standard operation procedure effectively, the result shows a significant improvement of the production than before. A SOP (Standard operation procedure) is a process that describes in details in detail the way that an operator should perform a given operation. SOPs include the purpose of the operation, the equipment and materials required how to perform the setup and operations required for the process, how to perform the maintenance and shutdown operations carried out by the worker, a description of safety issues and checklist. This SOP is one of several process documents required for consistent operation of a given process, with other documents including process flow chart. For example, Taylor (1998/1911) believed that workers were incapable of designing efficient processes, hence the need of management to design standard operating procedures. 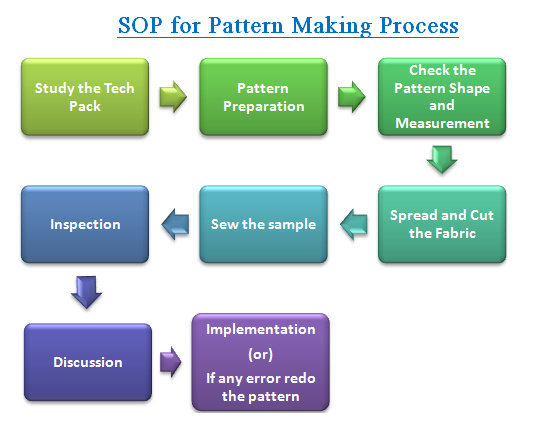 The objective of SOP is ‘optimal’ way to perform a given process. It helps to improve the process performance. SOPs are updated and workers are trained to the new procedures. Standardization is the process of developing and implementing technical standards. A study was conducted in the cutting and CAD section under a garment manufacturing company. Cutting section plays a vital role for apparel industries. Cutting section involve different types of critical process like pattern preparation, spreading, cutting, snickering, bundling, etc. Spreading: Spreading of the fabric to form a lay. Cutting: Cutting of the fabric. Labeling: It is the process of stick the stickers on garment component for identification and tracking purpose. Bundling: Here the garment components are bundled according to the requirement. This study introduces standard operation procedures in cutting department of the garment industry. 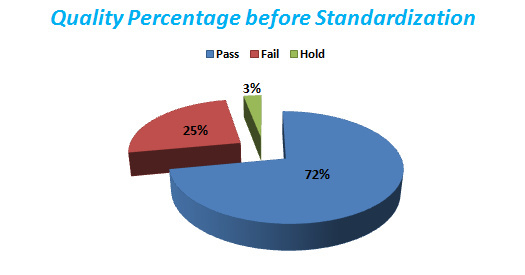 Standardization is the process of developing and implementing technical standards. Standardization can help to maximize productivity, safety and quality. First of all we have to study the particular place where we are framing standard operation procedure. Find out the problems present in the cutting department. Also get some ideas from the workers for standardization then frame the standard operation procedure for the cutting department. While framing the SOP we have to consider the quality parameters, it should not affect the quality of the product. Then consider the safety, it should not affect the safety of the labor and try to simplify the operation. Frame the SOP according to the 5S and kaizen system. It will help to improve the productivity, quality of the product, safety, effective utilization of machines and equipment. The above system needs to be implemented in-order to get the desired results. Other phases are sometimes included e.g., safety, security, and satisfaction. These however do not form a traditional set of “phases” as the additions of these extra steps are simply to clarify the benefits of 5S and not a different or more inclusive methodology. Kaizen Chinese and Japanese for “continuous improvement” when used in the business sense and applied to the workplace, kaizen refers to activities that continually improve all functions and involve all employees from the CEO to the assembly line workers. It also applies to processes, such as purchasing and logistics that cross organizational boundaries into the supply chain. It has been applied in healthcare, psychotherapy, life-coaching, government, banking, and other industries. By improving standardized activities and processes, kaizen aims to eliminate. Kaizen was first implemented in several Japanese businesses after the Second World War, influenced in part by American business and quality management teachers who visited the country. It has since spread throughout the world and is now being implemented in environments outside of business and productivity. After receiving the order first of all the pattern master should study the sample and technical package of the style. Then note down the requirements of the buyer. Prepare the pattern according to the measurement and also check the pattern shape, measurements. Cut the fabric and sew the garment. Inspect the garment according to the specification sheet. If there is any changes required means alter the pattern and finally implement the requirements to the final pattern. After that start the bulk production by using he final patterns. Quality issues on the pattern shape, measurement. It may affect the quality of the garment. Quality issues on the pattern size, shape, measurement will be altered before mass production. Eliminating the non value added activities. Standard operation procedure for machine spreading process is shown in the figure: 2. First of all preset the machine like cleaning, sharpen knife, marker length, no of lays, speed of the spreader) spreader clean the spreader and sharp the blade. Then verify the marker width and fabric width. Set the marker length and numbers of lays in the control panel of the spreader. Set the end catcher of the spreader. Starts the spreading process also measure the length of the lay by using the measuring tape for verification. Spread the fabric without any wrinkles. Maintain the end bit of the roll document. It is shown in the table: 1. then spread the marker on the lay. Pull the lay to the cutting area and start the cutting process. Quality issues in the lay like wrinkles and shrinkages. Standard operation procedure (SOP) for the straight knife cutting process is shown in the figure: 3. before staring the cutting process check the placement of the marker in the lay. Mention the required details on the lay also fix clip around the lay. To get the machine ready for chine should be cutting-To check if the cutting blade is sharpened evenly. The oiled &ensure there is no oil leakage. Wear mask and metal gloves for safety purpose of the operator. Start the cutting process and check the notches and symmetry of the pattern. Standard operation procedure for stickering process is shown in the figure: 4.Before starting the process the operator should wear the mask and clean the stickering machine. Select the color of the sticker and gum level of the sticker. There are many more color stickers are available like red, green, Yellow etc..,, Select the gum level depends upon the fabric type (heavy, medium, light). Check the gum level before staring the mass production. Stickering at right place of the garment component, it should not disturb the sewing process. Finally verify the numbers to the bundle sheet. By the standardization here the quality issues are rectified and the production improved in the cutting department of apparel industry likewise the safety of the operator improved. 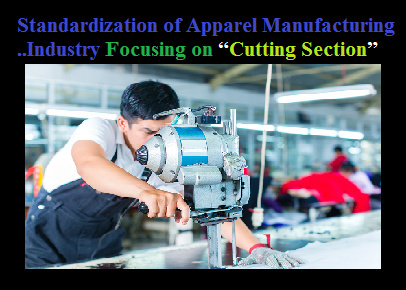 The suggestive SOP developed in this article cover a comprehensive series of aspects in minimizing reworks in the cutting section of apparel industries by ensuring quality production. Standardization depends upon the type of industry. So manufacturing the quality product is mandatory to sustain in this global competitive market. Cutting is the heart of the apparel industry also the perfect pattern and garment components only can make the quality product like good fit and size. Quality is ultimately a question of customer satisfaction. Good Quality increases the value of a product or service, establishes brand name, and builds up good reputation for the garment exporter, which in turn results into consumer satisfaction, high sales. The study clearly indicates that by eliminating non-productive activities like reworks in the apparel industries time as well as cost is saved by SOP (Standard operation procedure). JUKI corporation sewing research institute. Production Control Tools for Garment Industry 1st Edition. Heizer, J., and Render, B. (2000), Principles of Operations Management 4th Edition. Pearson College Div.ISBN-10: 0130271470. Roy, R. N. (2005). Modern Approach to Operations Management. Daryaganj, Delhi, India: New Age International. The author is currently an undergraduate student at the Department of Fashion Technology of Angel college of Engineering and Technology, Tirupur. His area of interests includes standardization, Lean Manufacturing. If you like this article please do not forget to share on facebook and put your valuable comment.